Please put your headphones on and listen to a very lively Show 235 from Australia! Today our show will take you to the “Lucky Country“, where the Australians with their often multicultural backgrounds have developed a positive “can-do”- attitude and try to give everybody a “fair go”. I have been pretending to be one of them for four months now, as I am teaching and doing research down-under at the University of the Sunshine Coast. Listen to my interviewees in Australia. 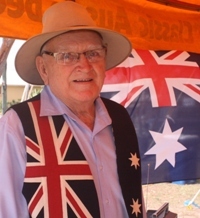 Last Saturday, 26 January 2019 we celebrated Australia Day, and I planned to go out with my microphone to share my Australian impressions with you, the listeners. In order to prepare myself, I listened to my own show about Australia Day which I did five years ago which really nicely captured the spirit of the day. I hope you will forgive me, but at that point I put away my microphone, uploaded show 175 again and enjoyed the celebrations in Noosaville hands-free, as a guest, not as a podcaster this time. Please put your headphones on and listen to Show 175 from Australia! If you like the podcast then please also LIKE US ON FACEBOOK! Today our show will take you to the “Lucky Country“, where the inhabitants with distinctive multicultural backgrounds have developed a positive “can-do”- attitude and try to give everybody a “fair go”. Listen to my interviewees in Australia. On the last weekend in January we celebrated Australia Day, and I took along the microphone to share my impressions with you. Let us listen to two typical Australians whose ancestors came over from Europe. I met Vivian and Wayne in Sydney Harbour over coffee and with the beautiful view on the Opera House and the Harbour Bridge and when I was conducting the interview I wished we had a video podcast so I could have shared with you a perfect hot summer morning in late December. Three weeks later I had left New South Wales and was back on the Sunshine Coast. Let us see whether in Queensland being Australian is also about football, meat pies, and BBQs. I asked some colleagues from the University of the Sunshine Coast how they were planning to celebrate Australia Day. Bishnu told us that when he first moved to Australia he did not really like eating lamb but now it has turned into his favourite dish. Talk about successful integration! I am following up this topic of the first owners of the land and asked how the attitudes of ordinary Australians towards Aborigines and Torres Strait Islanders have changed over the years in society and in education. Every year the Australian of the Year is elected and this person will give important public speeches during that year. This year I was fortunate enough to be able to listen to the speech of the outgoing Australian of the Year talking about attitudes to indiginous people and to multiculturalism in general. You could really see on Ita Buttrose’s face how happy she is that her ancestors came over to Australia in the 1850ies. On 26 January I visited Australia Day in Noosa, Queensland, in search of examples and explanations of the”can-do” attitude, the “fair go” and the “Lucky Country”. I did not have to search long because the first person I met, John Major, “Bush Poet” and former farmer, explained to me in his own words what these Australian concepts are all about for him. And do not miss the brass band at the beginning and the end of that interview! Would you like to share with us your own intercultural experience in foreign countries? If so, we would be delighted to hear both positive and negative experiences, so don´t hesitate and share your intercultural experiences with it with us on our Facebook Page. Our next show will be coming to you on 7 March from Anne Fox in Denmark. And please visit our Facebook page.